Limecrete is a traditional alternative to concrete, which offers a breathable surface. It is widely chosen by architects and specialists for the protection of historic buildings. While some surfaces are impermeable meaning that moisture may become trapped and ultimately leads to damp and other related problems, limecrete flooring provides a breathable finish that does not hold in moisture, allowing any vapour to escape. This attribute means it also handles all types of weather, as the surface is able to benefit from natural airflow. The result is a resilient floor that offers longevity. 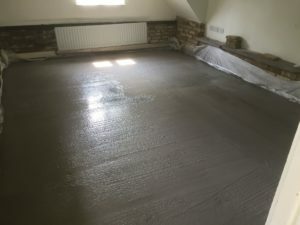 Setting limecrete does require expert knowledge of the carbonation process for the hardening of the lime and also experience of the techniques involved and the impact of weather. Nevertheless, it is a process that the Emmerson Critchley team is extremely well versed in and the company is fully insured to work on all types of buildings including Listed ones. Often made with recycled materials, limecrete is often a greener alternative to other options.